Stocking Stuffers, Groomsmen Gift, Father of the Bride, Anniversaries, Fathers Day, Christmas, and Graduations. Whether used for decorative display, at special events, or as your everyday bottle opener; Bottle Breacher is sure to impress your friends and get people talking. They are made from dummy ammunition, making them completely safe. Dummy ammunition is a round that lacks a live primer or any gun powder. As seen on Shark Tank! 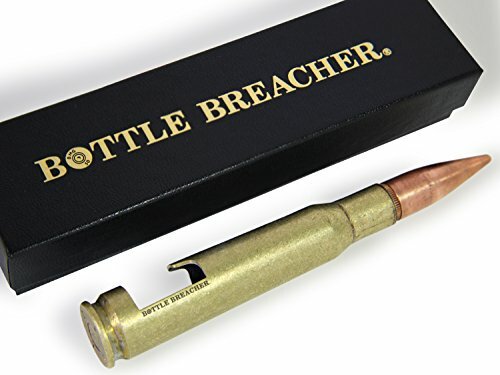 INCLUDES: The Bottle Breacher is a high quality, hand crafted, authentic Vintage Brass 50 Caliber BMG bottle opener. You get a GIFT BOX too! Each Bottle Breacher is MADE IN THE USA by a VETERAN OWNED & OPERATED Company. GIFT IDEAS: The perfect conversation piece for any special occasion or event. Father's Day, Valentine's Day, Wedding, Birthday, Anniversary, Christmas, Stocking Stuffers, House Warming, Thanksgiving, Mother's Day, Retirement and Graduation. WHO WE ARE: Bottle Breacher started in a one car garage in San Diego in 2012 while Owner, Eli Crane, was an active duty Navy SEAL. Eli wanted to be home more for his family after serving five deployments. When you buy a Bottle Breacher you HELP CREATE LOCAL JOBS as we manufacturer in the USA in addition to raise awareness for Veteran issues and help support Veteran non-profits. GIVING BACK: Your SUPPORT through purchasing Bottle Breacher allows us to GIVE BACK to Active Duty and Veteran NON-PROFIT organizations. Some of the organizations we SUPPORT are Wishes for Warriors, Eagle Fund, Chris Kyle Memorial Benefit and Joggin' for Frogmen. MEDIA COVERAGE: Bottle Breacher debuted on SHARK TANK November 2014 partnering with Kevin O'Leary and Mark Cuban Companies. We have also been featured on two Shark Tank Updates, ABC's Beyond the Tank, and most recently the 700 Club and Fox & Friends. If you have any questions about this product by Bottle Breacher, contact us by completing and submitting the form below. If you are looking for a specif part number, please include it with your message.